**Warning… some science and psychology in this article… reader beware! Among the most natural of human instincts is the need to convince oneself that one's actions are good and acceptable. In order to understand what is generally called self-justification we have to start with another scientific term; cognitive dissonance. 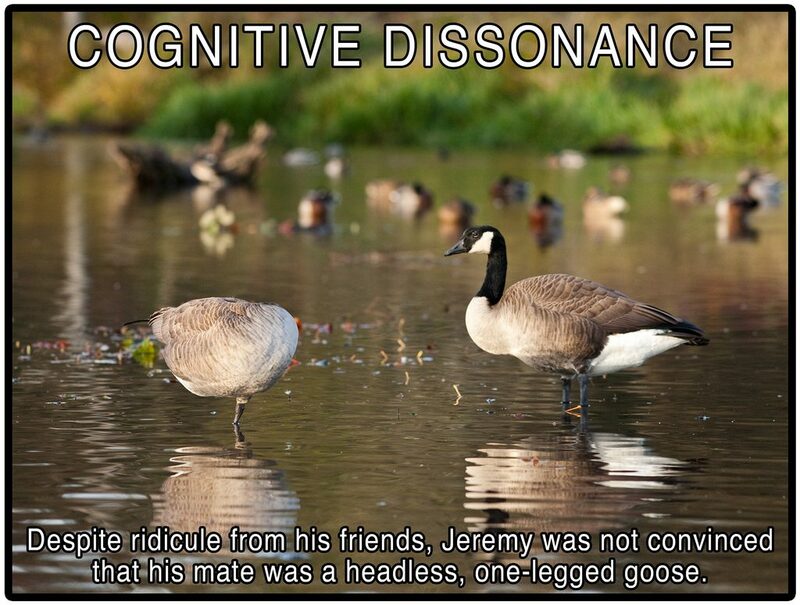 Cognitive dissonance is used to describe the state of a human when they become aware of a fact that doesn't match up with their existing beliefs. For example if you believe the earth is flat and someone presents you with evidence that it is in fact round that creates dissonance. If you believe that enacting universal background checks and magazine limitations would make our society safer and you are presented with facts that suggest otherwise that creates dissonance. If you think of yourself as a competent and safe shooter but find yourself handling the firearm in a way that isn't safe that creates dissonance. Understand that cognitive dissonance is like an emergency in the human mind. You cannot withstand it at all. The human has three different ways to deal with dissonance. Option one is to alter either the existing belief to make sense with the new information or to alter or justify the new information to fit the existing belief (I bet you know which is more common). Option two is to accept that you don't have all the information to fully understand the information you have. Not common. Option three is to be driven insane. When you have two conflicting realities in your mind you will be driven crazy to the point of suicide, seeking professional help, or dissolving the confusion in drugs. Thus the human tends to receive all information through one's current paradigm; constantly adjusting the information to fit existing beliefs in such a way as to reduce or eliminate dissonance. We see this when research is released around a highly political topic. Each side of the debate takes the same information and uses it to prove their point because they can only see the information in a way that justifies their current position. The implications are enormous in every arena of our lives but I want to highlight some of the implications surrounding firearms. In surveys 93% of American drivers mark themselves as better than average in driving skills. Similarly I suspect most of us think our firearm handling skills are above par. The mere idea that we could or might break some or any of the basic safety rules comes as a bit of a hit to our own ego. In the chance that someone observes us make a mistake we immediately attempt to convince ourselves, and sometimes others also that we were justified because of some special, personal, or specific reason. How often do we just say, “thanks for telling me; I will try harder to follow the rules.” Even now I suspect many of us read this paragraph and think to ourselves that we would of course take it with humility but the brain will self-justify faster than you can imagine. I think there are also lessons to be learned from cognitive dissonance when it comes to discussions about firearm related law. Sometimes we talk ourselves (and others) blue in the face trying to get them to see our point of view but it doesn't do any good because they can only reconcile everything we present to them through the paradigm of their current belief, and we do the same. Instead we have to find ways to force people to question their existing belief and that is far more difficult than just a passionate text message or Facebook post. It requires well thought out and thorough ideas with research and fact that removes any potential escape of justification or other dissonance reducing behavior. But if the ego is removed from the experience of what you refer to as cognitive dissonance, you merely have the choice to think without bias.